the usa needs a new constitution. but it’s too late. slow collapse seems likely, and given the shaky condition of the environment, may play a large role in population collapse as well. or even extinction. Please elaborate – what would you want in a new constitution? the american constitution was written to ensure the rule of wealth, and it has been brilliantly successful in that aim. one consequence is the second gilded age, another the imperial grip on many of the world’s governments and resources. perhaps, worst, the pursuit of more wealth underlies much of the environmental destruction. i can not be certain that, if democracy suddenly flourished the nation and world would saved, but i believe it is the best chance humanity has. but, it will not happen. what will happen is, the snap-back from disturbing the chemical and physical and biological balance of the planet is going to sting. I wonder how the members of a constitutional convention in 2018 would compare in intellect and wisdom with those who constructed the original constitution? al loomis, how does the US Constitution “ensure the rule of wealth”? Also, I’d like to see your idea of a new constitution. Here’s what I’d put into it. I’d have a parliamentary system with proportional representation, and I’d de-emphasize the presidency, make it a mostly ceremonial position. I’d have good freedom-of-speech guarantees, separation of religion and state, and other such things, but I’d dump the Second Amendment as very badly written. I’m not sure how I’d handle states vs. Federal Government. IMO, it’s good to have some hierarchy of administration, so as to handle smaller-scale things more efficiently. But I’m not sure how much autonomy is reasonable for the states. I agree that a new constitution wouldn’t be a bad idea (the one we live with was written >200 y ago, when the US was a very different country). But the legal institutions are not why we are at this impasse. It’s the new level of intra-elite conflict and unwillingness to compromise that is the main cause. And how do you suggest to reduce the excessive elite levels to reduce the intraelite competition, Peter? “a new constitution wouldn’t be a bad idea”: It depends on the new constitution! The devil is in the details. Republican hopes (including a rehearsal) for a constitutional convention are no doubt intended to use it as a weapon in the ongoing intra-elite competition. That would result in new constitutional provisions crafted for partisan rather than unifying purposes. Schumer and the dinosaur GOP are the same totally selfish never-Trump establishment who are unable to cooperate towards anything constructive for their own polity, America. Donald Trump was voted in by Americans because they figured out the DNC and the GOP are one and the same charlatans. Once the dinosaur elements in Congress and the Senate get voted out at the up-coming elections, and people have noticed how massively corrupt, vile and anti-American many of them are and they will act, there will be a dramatic improvement in level of cooperation between law-makers and the Trump administration. Expect more Rand Pauls and fewer John McCains. I don’t understand the hero worship that President Trump has been receiving. He does not seem very competent to me. He works very little, he spends much of his time golfing or watching TV, and he wants his briefings short and full of pictures. He is also less articulate than he had been in decades past, less able to make arguments. He is also narcissistic and vengeful, easily moved by flattery and wanting to settle scores with those who have wronged him. He has even acted as if Congresspeople are his employees –not just Democratic ones but also Republican ones. His governance so far has been rather mainstream Republican, and he has failed to keep many of his more notable campaign promises. One of them is being immune to corruption because of his wealth — he and his family have continued to be on the take during his presidency. I think that his presidency is a clear result of the disintegrative state that the US is in at this time — frustration with existing politicians and the existing political order. Trump won on one issue: immigration. His supporters are better educated and make more than Hillary’s. Many of his supporters recognize that he is a loose cannon, and dangerous. But, they are fed up with the choice between tweedle dum and tweedle dee. They understand the hate and the fury, but know that actions are what count. So far, he hasn’t done the damage that G. W. Bush did in his first year, or that GW and Obama did in their tenure. I agree with you on the disintegrative state . . . e pluribus multum, and chaos follows. So what is the damage that W, GW, and Obama have done that Trump hasn’t done, according to you? What is the damage (on their watch)? GW – 9/11 (assisted by WJC), Iraq, Financial Crisis, increased debt, . . . The financial crisis built over years. Obama actually deported more Latin Americans than anyone before or since. Despite the rhetoric, Trump has deported less. So what political positions do you have, if any? Will you say Trump did damage too if a financial crisis happens on his watch? Pardon my naïveté, but much as I try to put my biases aside and look objectively, the implication that right and left are equally responsible for this terrifying trend sticks in my craw. Is it not a fact that since the 1960s (which I remember well) the political climate has shifted further and further to the right, with current GOP positions being so extreme they were not even part of political discourse 30 years ago? The left have also drifted slightly right, such that current Democratic centrists might be hard to distinguish from mainstream Republicans in the 70s? Or are my biases too great to allow rational thinking. I want to add that I am not suggesting that assigning responsibility is going to help the situation in any way, Like Al Loomis. I fear we are in for interesting times. the natural condition of the usa is ‘right-wing.’ there was a brief and largely ineffectual populist swing in the 50’s, due to the great depression and ww2. This is a big topic, so just a few comments off the cuff. I find the “right” and the “left” as completely unhelpful concepts to organize our thinking of today’s politics in the US. What I think you refer to is the abandonment of the unwritten social contract, forged during the New Deal, that ensured fair division of fruits of economic growth between employees and employers. On the other hand, this country made great strides in protecting minority rights over the same 50 years. What’s left and right? Following the insight of Jack Goldstone, one needs to look below the ideological surface to the partisan interests of contending elite factions. Perhaps Republicans led in the abandonment of social norms governing political discourse and functioning of this republic, but Democrats have joined in. The last two government shutdowns (under Obama and today) demonstrate this symmetry. To add another thought: in my historical analyses of previous ages of discord it’s a recurrent theme that each side of the civil war thinks of themselves as virtuous. As you said it, assigning blame is not going to help the situation. There is a worldwide reaction against open borders and the Democrats and EU elites are on the wrong side of the issue. Huntington seems prophetic in his Clash of Civilizations, everywhere people want to be among their own kind in a familiar culture. Adding to the sense of uncertainty is an explosion of disruptive technology with a lot more to come. The reaction against Trump is similar in tone and intensity to the reaction against Lincoln, but there is no region to organize and start a war this time. From where I live near Houston Texas, it looks like Trump support has greatly increased. Will the thousands of women reportedly flocking to Emily’s List actually win anywhere in the red states? The election this year IMO is likely to go to the Republicans, increasing Senate majorities, and the house will stay Republican. The Democrats will have to come up with something very different from identity politics to start winning elections. Intersectionality looks like insanity to most people, but will have to run its course among the Democrat Elites. I think the eventual issue that will revitalize the Democrats . will be a universal basic income, but I don’t think it will happen very quickly. If your prediction about mid-term elections folds, that would be a very powerful blow for the Democrats, because the opposition party usually _gains_ seats in these elections. I will take that bet. The evidence is against the republicans. The actual voting we have seen since the 2016 elections is strongly against the republicans. Historical and actual results point to major gains by the dems. 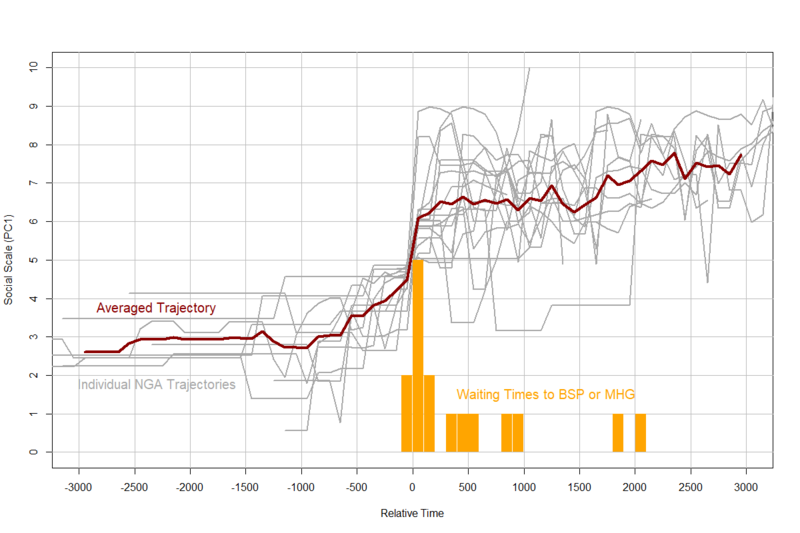 Part of the problem is applying rational data to a discontinuous system. Feed back loops matter, small events can have major impact. Trump is historically bad. Really, really bad. Completely incapable of doing the job. Politics and policies aside, this matters. He can not carry the weight of the movement everyone assigns to him. New political ages are not started by people who lose the popular vote. They are started by individuals that get large margins and build on them (FDR, Reagan). I dont know if what replaces Trump will be the beginning of a new age of just more polarization. I just know Trump is gone. Democratic policy of Universal Income is predicated on there being a lot of poor people to receive it. That’s not a message Americans want to hear. Why should America be full of desperately poor people who need a Universal Income? They want to be promised a bright future where they too can be rich, and their money is not being stolen from them by corrupt elites. They don’t want Americans to need to receive a Universal Income. The policy might become established anyway but more incidentally without much fanfare. Blaming “the Democrats and EU elites” for wanting open borders is just plain silly. Many business leaders have liked open borders because it means a lot of cheap labor. Our host noted in “Ages of Discord” how much some business leaders loved the “golden stream” of immigrants, because of how it made the supply of labor so high relative to those leaders’ demand for it. Also, some place near Houston, TX is not very typical of the US. In special elections recently, several Republicans have *lost*. Like Roy Moore in Alabama. Why does Intersectionality look like insanity? I don’t get it. As to identity politics, it seems to me that white nationalism is also a kind of identity politics. Europe’s core states mainly wanted open boarders for export; less regulations; and in a cultural sence to prevent another worldwar. They never accepted open boarders with Turkey or Morocco, where cheap labor came from. Cheap labor never involved people from the core states. The recent problems with immigration happened because of human rights policies, allowing for economic refugees to enter the country and benefit from social subsidies, where its politicians were blamed for. They had not realised the economic repercussions of their utopian ideals. In retrospect, of course because no one else had realized this either. But anyway that’s what politicians are for. 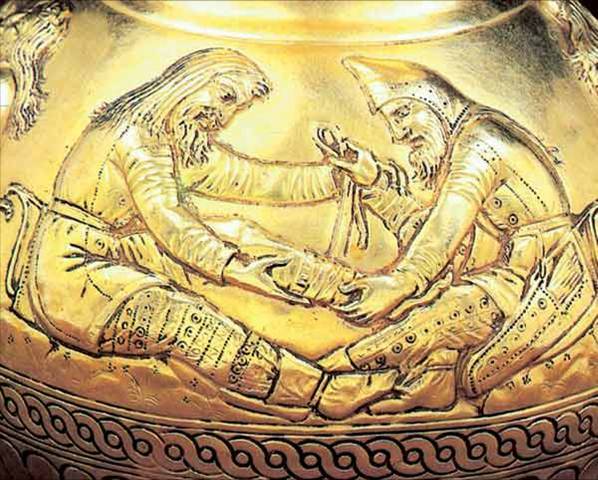 Their ideals for cultural exchange also never happened, because they never organized it, realising this is very difficult when someone in Denmark has not got a clue what and why a person in Greece is thinking and does not care to know either. As for the US and Mexico you are probably right. cheap labor involved people of cores states: internal immigration from south to north in Italy or from est to west in Germany, as an exemple. and even before the recent wave, there is a lot of country where there is a second or thirth generation. in Italy is relative recent, around 1985 that economic extra eu migrant start to came, but even before 2008 we have around 10% of strangers. in fact without immigration population growth in Italy start to became negative around 1996. Yes, there have always been flows between cities and rural areas involving cheap labor as well. The same phenomena repeats itself on different scales, like national weaker and stronger economic areas as well. But this time it is on a continental scale, much harder to control, or mitigate itself. Which is also related to core economic centers getting weaker themselves this time because of global efficiency, so social unequality becomes an overall issue again. Apart from some rural states which were ’empty’, still having benefits from it, those are exeptions. In light of the “Ages of Discord”, the logic behind the increase in political polarization is fairly transparent (overproduction of the elite and, as a consequence, inter-elite conflict). Could you clarify the mechanism behind the periodic decline in political confrontation, for example between the First and Second World Wars? 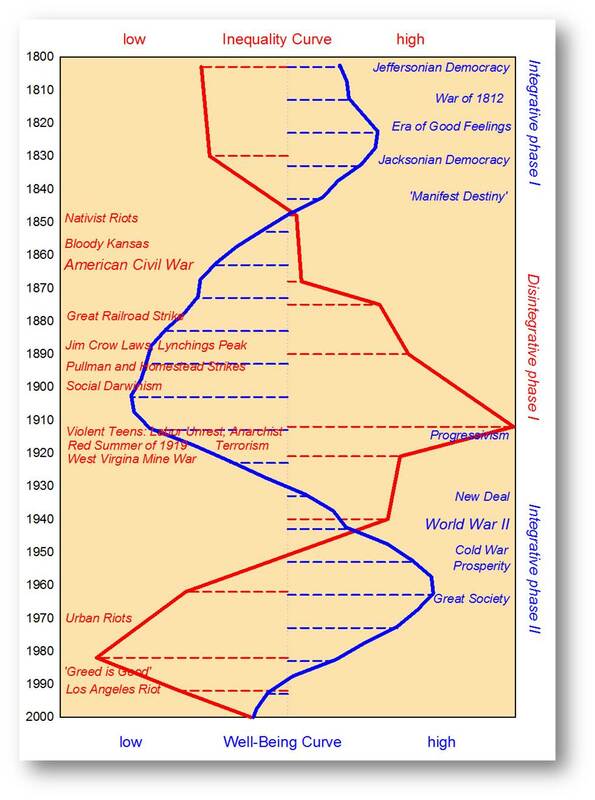 I have clarified — that’s what Chapter 10 (From the Gilded Age to the New Deal) in Ages of Discord is about. To summarize your chapter 10, how is this? The elites were fearful of revolution, so they deliberately unified, downsized in number, and downsized in wealth. Well, downsizing in wealth is easy; enough elites see high taxes on the wealthy as a good thing (we are moving there). The number of applicants to law schools is also decreasing. Soon, numerous law schools will shut down. You may have your eye on an early indicator that I don’t know about, but the elite currently want low taxes and we have been moving in the direction of lowering taxes very fast. Regarding law schools, it is interesting to speculate that the number of law graduates will decrease (suggesting reduction in elite numbers and hence intra-elite competition), while the Yale law school tuition will continue to climb (a proxy that Turchin uses that suggests increasing intra-elite competition). We’ll see. List price isn’t a terrific indicator as so many law schools (really, all but the very tippy-top like YLS, HLS, and SLS) hand out discounts (ahem, merit scholarships) these days. Polarization measures whether our representatives agree vs disagree with each other. In a dynamic, pluralistic republic, shouldn’t you expect representatives and parties to have very different views on major issues? Low Congressional polarization may be a sign that Americans are unified. But it may also be a sign that only 1 party is actually arguing for their beliefs while the other rolls over. That’s hardly something to cheer about. A lack of pushback against major legislation isn’t necessarily a good sign. The current level of dysfunction does seem like a problem. Perhaps those of us on the Left ought to tone down the rancor by, say, passing a pro-life amendment and reforming entitlement programs. Or perhaps those of us on the Right should vote to raise taxes and legalize illegal immigrants. Not keen on one of those? Then I guess you’re part of the polarization problem. 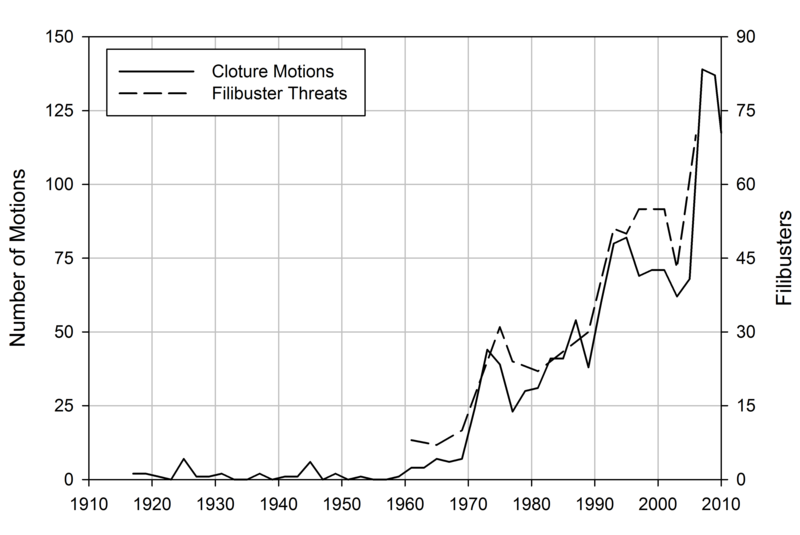 Counting filibusters as a measure of dysfunction has some problems. Starting in 1970, there was a series of rules changes making filibusters easier. No longer, do filibusters shut down the whole business of the Senate or require that Senators actually speak. It is not surprising that they have become more common. It is also useful to consider an alternate hypothesis. Starting in 2001, the US has had a series of inept Presidents, who have had little experience with the details of government. It was noticeable, that both Bush & Obama were doing better by the end of their terms. For the system to work, the President needs to be effective. Historically, democracy rose in lockstep with the nation state. Multi-ethnic states and empires – Austria-Hungary, Czarist Russia, the Soviet Union, Yugoslavia – were autocracies whose collapse created nation states with at least somewhat democratic forms of government. The deeper question is: Are the levels of ethnic, cultural and religious diversity to which the United States has drifted over the last half century compatible with a functioning democracy? 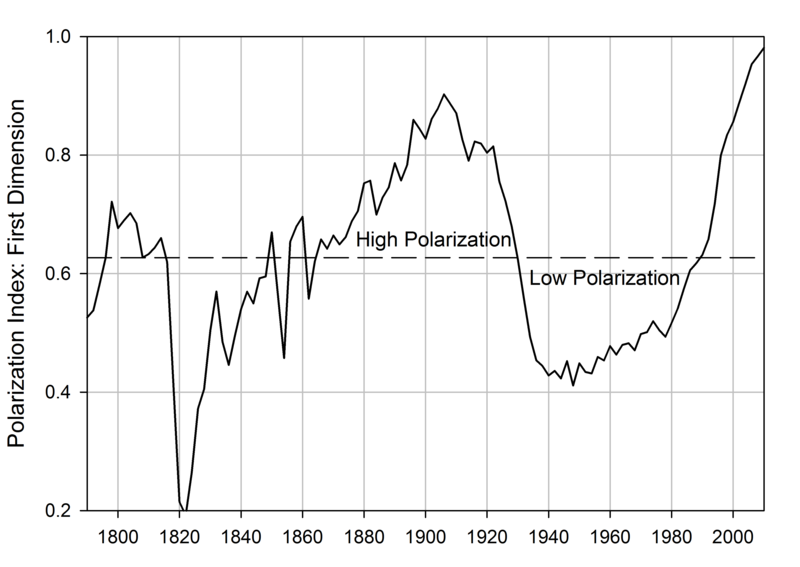 Looking at the graph of congressional polarization, I cannot help noticing that the restrictions on immigration imposed in the early 1920s were followed by an age of low polarization, and the start of new mass immigration in the 1960s was followed by rising polarization. Is this merely a coincidence? Are the United States going to break up into a loose federation of ethnostates by the end of the 21st century? Perhaps it should! Gerhard, what you are suggesting has been apparent as a possible future for the United States, and not just among advocates of ethnostates, nor by non-politically acceptable fringe thinkers. The United States is large geographically, and the distinctive character of each region seems to have become less, rather than more similar over time. We didn’t have the luxury of contemplating polarization in the late 1920s and most of the 1930s due to the Great Depression which was a great equalizer in poverty. That was followed shortly after by World War 2, and the Cold War, both of which served to reinforce the importance of unity and shared purpose for survival of the nation as a whole. We had plenty of immigrants throughout that time, but they were eager to assimilate culturally, socially and economically. As you said, the age of low polarization ended in the 1960s, with increases in immigration as well as fragmentation in the social structure of the USA for the next 50 years, through the present. Prior to the 1960s, regardless of religious faith or race/ethnicity, Americans had similar lifestyles of marriage, family, work, local community, and religious worship. 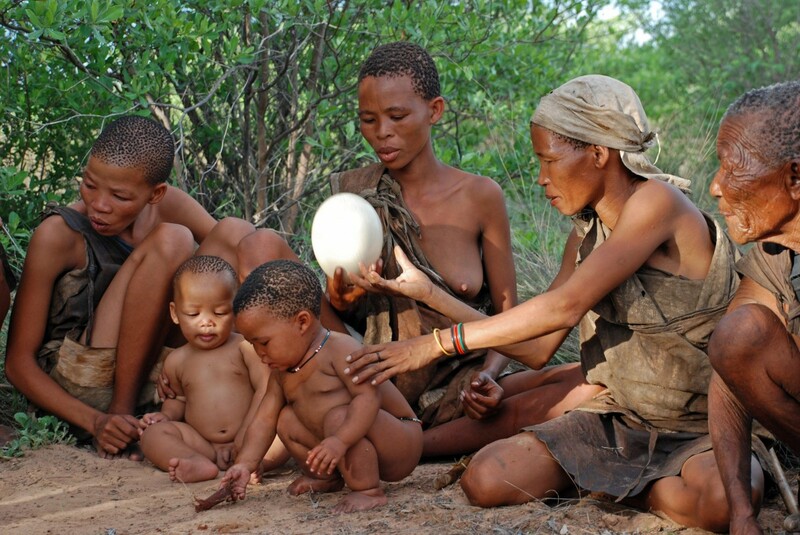 We were quite homogeneous, regardless of social status, race/ethnicity, wealth or education. In the past 30 years, this consistency of outlook has splintered. Immigrants per se are not the cause as much as a dominant social narrative that praises and preserves countless cultural identities, rather than the intense desire of past immigrants to assimilate. In fact, the cultural, celebrity and academic elite’s self-loathing of America’s history (as imperialist, racist, bellicose, religiously primitive, etc.) is a constant and increasing source of strife and diminished national pride. Due to K12 education and university curricula, this cynical world view and narrative of national decline and shame is reinforced in the next generation of Americans. It is not an unlikely scenario, where the USA splinters into ethnostates or some other non-cohesive governing arrangement. Interesting overview/ but I presume it is foremost economic evolution which led to this equation and not primarily the cultural one, although there are also backtranslations into that, as you mentioned, like family behavior which has become more independent and often random (insecure)/ not because it does not want to assimilate, but because economy foretells this. As well as cultural political back reflections on previous federal state behavior, which is honest and not perse the main reason for discontent. It does want a different believe system, as far as parts of it already belong to closed history, it’s no more than a reflection on that. Because the economic evolution as it is foretells a higher efficiency, meaning specialized centers fo production in low cost, in a global perspective this becomes less regional, foremost because the first regions inflated their cost the most, which translates into the inverted relation of consumption income. Hence immigrants are less wanted in this equation, because they compete with local inflation and also in behavior and religion/ although that is second level discontent, it imposes itself on cultural aspects too. This regional consequence leads to (political) cultural retreat (closing the borders, independent rights, currency) which is notable in many if not all arrived economies mainly in the west. But cannot solve the problem, can be foretold. That’s grossly unhistorical about previous generations of immigrants wanting to assimilate. Many of them did not assimilate very fast, and they were often disliked for not doing so. In fact, there is a long American tradition of descendants of immigrants hating recent ones. As to religion, many Protestants have long hated Catholics as superstitious idolators who have pledged loyalty to a foreign power. In fact, some of the New England colonies banned Christmas celebrations as too Catholic. In the late 19th cy., as large numbers of Catholic immigrants came in from Ireland, Italy, and eastern Europe, some Republican declared that his party is not the party of “rum, Romanism, and rebellion”, referring to CH3CH2OH consumption, Catholicism, and the South in the Civil War. As to focusing on bad things in US history, it must be noted that sometimes one has to bite the bullet and face ugly truths. I certainly don’t agree with the Chomskyite position that the US is a uniquely evil nation, but to call it a uniquely good nation is the opposite extreme. You are recalling a past that never existed. Prior to the ’60’s, there was strong anti-Irish, anti-Semitic, anti-Asian, and racist anti-black bias. Your typical Anglo-descendent American WASP in the ’30’s certainly did _not_ see Jews, Irish-Americans, southern Europeans, Asian-Americans, Hispanic Americans, and African-Americans as sharing the same lifestyle, community, and religious worship as him/her. Did you see through your rose-colored glasses that Jews (and southern Catholics, and any non-whites) were discriminated against by both the Ivies and white shoe law firms back in those halcyon days of yore? Colin Woodard, in his book “American Nations”, notes that Americans were always divided, because different parts of the Atlantic coast were settled by different groups of Britons with different customs and values. “Albion’s Seed” is an earlier work that makes much the same points. 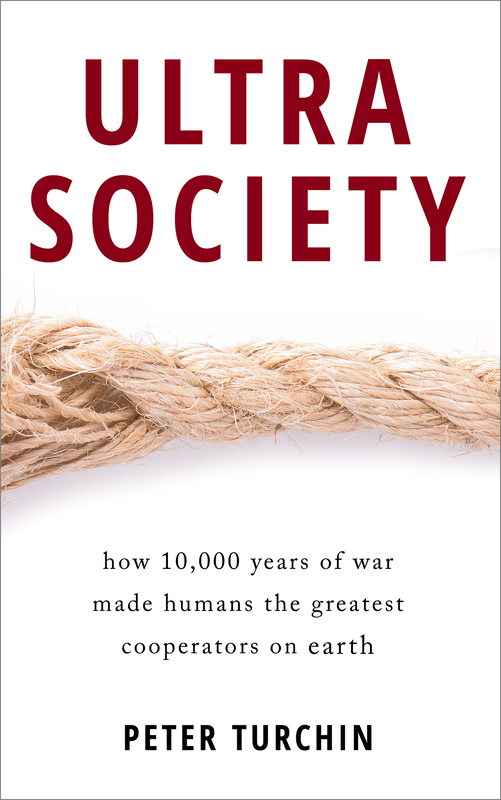 That even extends to religion, where there has long been a split between trying to create a good society and meekly accepting this world’s miseries while trying to punish sinners. The former tendency even got a name in the late 19th cy. : the Social Gospel. It should be noted that the ex-Confederacy tends to be more violent and more punitive than the northeastern states. Lynchings were common in the South but rare in the North, for instance. Articles like this would have too un-PC for even right wing publications to run just a few years ago http://www.americanthinker.com/articles/2018/01/what_i_learned_in_peace_corps_in_africa_trump_is_right.html I predict that the trickle will become a flood as the year unfolds and the debate over merit based immigration continues. The left has forced the cultural issue and it will have to be discussed and a new or renewed consensus achieved before political peace is restored. They have almost run out of victims to fight for. The almost explosive popularity of Jordan Peterson is another indication of more and more people joining the debate and taking sides. The problem is not so much Donald Trump’s dismissing some places as hopelessly backward. It’s his implication that it makes people from such places so tainted that they must be kept out whatever the cost. That strikes me as gross bigotry. Furthermore, it would be hard to call him mentally stable or a great genius. He is also not the healthiest president that there ever was. If I had to vote for someone, it would be Teddy Roosevelt. Over the last year or so, his speeches have been rambling and incoherent with a limited vocabulary. It is evident that he is much less articulate now than he was in past decades. So I think that he will likely go down in history as one of the worst presidents ever, if not *the* worst. If nothing else, he has likely had the worst first year ever. He makes George Bush II seem like a good president. There’s a theory that the stability of any government is a combination of people (their willingness to support political norms) and institutions (their independence from political pressure and norms they follow in executing their mission). The US’ previous disintegrative phase didn’t feature all the institutions of government we have now, and didn’t feature the institutional mechanisms today’s elites have through finely tuned lobbying, think tanks, and participation at points in their careers in those same institutions. They form “the establishment” and their goal is to maintain the status quo. The US government may show some resilience in the face of what the Washington Post call “Trumpism” through the strength of its institutions at the federal level. Closed borders can be perceived as a reflection of cultural problems; which might very well be also involved/ but in this case the underlying primary cause is economics. It is either experienced as an attack on the fiscal state (Europe)/ or as an attack on the labor state (US). But in both cases they are caused by the same economics, loosing its fabric. Resilience. Although played out differently in political response. Of course they are and remain back reactions not addressing the original issue/ but nevertheless suggest a political relevance when solving it. Both elites are delusional, so being right or wrong frankly does not make a difference. The question is how the last one will respond and under what conditions. In the classic role play between military and trade each one follows the other predictably, but in this case immigrants I am affraid will not do. Then again humanity might have learned from the past a different solution is wanted, it still does not know how to address this. The Senate just needs to deep six the filibuster. The whole point of the filibuster was to insure that the South could block any national civil rights legislation. Guess what, we got national civil rights legislation in the Kennedy/Johnson administration, so there is no point anymore, it just contributes to log jam and inefficiency. Dump the filibuster so we can stop the democratic clown show and re-establish rule by the majority. The Democrats will welcome that after 2020 (2024 at the latest, though if it takes that long, we very well may see a second American Civil War). Before launching the idea of creating a new constitution, we might consider a few simple steps to reinforce a sense of unity and restore the status of the public domain, under attack since Reagan. After having lived here now for three years (first in Washington D.C. and now on Long Island) what strikes me most is the lack of unifying aspects. Everything seems to be in het grip of short term, commercial and competing interests. As mentioned elsewhere, it might be an idea to hold the general elections on a national holiday to facilitate those who cannot afford to take the day off. Secondly, make voting mandatory again like paying taxes. It may mitigate the threats of gerrymandering and force states to open enough venues. Thirdly, reinstate the national draft (but without the loopholes). Ultimately, the army formed the start of the democracy (as in Greece and Rome). A national draft may restore again a sense of unity and offers the opportunity to experience the US as a national entity for people (men and women) from all walks of life. I am very worried about the tendency to privatize the army. It happened in the Roman republic (albeit a completely different society) and destroyed the few remaining truly democratic aspects. Seems like the pressure of the Soviet Union in the 1950s kept elites from letting their competition get out of hand. Now, with the US militarily unchallenged, elite competition runs out of control, and we get a media circus/sideshow. This has nothing to do with military; although their cost and ineffectiveness plays a second role in GDP/ but with trade. The harvard elites act contrary to what democracy wants. Focussing on military (cia) interests has led to the fall of the dems in elections, ignoring their national economy, where in paradox the wife of he who said: “Its the economy stupid”, apparently forgot the message. This is what happened after the Roman republic became the sole superpower in the Mediterranean. It imploded.